I preached at the Stromness Baptist Church this morning on the four passages from the Lectionary. They were Gen 2:15-17, 3:1-7, Mat 4:1-11, Romans 5:12-19 and Psalm 32. One of those passages was the Temptation of Jesus in the wilderness. Steve Taylor had a good idea for this, and the other Sundays during Lent. find seven items you would most want to take if you were travelling 40 days into a desert. find a piece of Lenten fabric; a cloth that you feel best captures how you feel about entering Lent. find a place in your house that these seven items might remain over the Lenten period and place them on your Lenten Fabric. send a photo of your items to us at spirit2go at gmail dot com and we will add it to the photodisplay. Spirituality2Go. So I did this, at the church, and talked about each item. Then took a photo for Steves blog. Fabric: the lightweight black nylon of a traveler/pilgrim, which actually is a bag to hold my stuff. 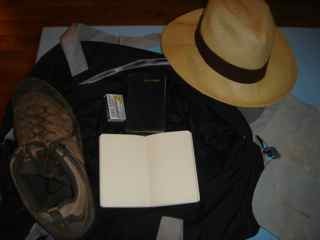 7 Things: Pillow, hiking boots, notebook and pen, suntan lotion or creme, panama hat, bible, matches and toothbrush. Oops. Thats 9. OK. I will leave behind the pillow and lotion. The message went pretty well. I tapped into some thoughts on being Eikons from Scot McKnight’s A Community Called Atonement and drew from the excellent Lent chapter from Baptist theologican John Colwell, who talks about our authentic humanity in his book The Rhythm of Doctrine. I also mentioned the movie Atonement in relation to Psalm 32 and the joy of sins forgiven and living within God’s limits. We touched on some atonement images. And Lent as a time of re-calibrating and re-finding those limits and entering into the fulness of an authentic humanity.
. . . sounds great, good idea! Lent as a time of re-calibrating and re-finding those limits and entering into the fulness of an authentic humanity. Right on Andrew! Next Post (n)	Him that p***eth against the wall.